This week has been all about survival for me. It’s fair to say the whole having a child with a broken leg thing is getting a bit old now. My back is aching from lifting her, my ankles and feet are getting puffier by the day and I’m just, well, knackered. It’s not all moan, moan, moan though. With any luck Frog’s cast will be taken off in a couple of weeks and then, a week after that, it will be the school holidays meaning the (self-proclaimed) Northern Love Machine will be at home (he’s a teacher) and adventures can begin. When we talked about having a second baby we both agreed the autumn would be an ideal time for us. Frog will be at school by then, plus the NLM will be at home over the summer when I’m huge and struggling to juggle work deadlines with being pregnant and running around after a four year old. Mind you, it’s recently dawned on me this means Frog will be facing two huge areas of change in one go: becoming a big sister and starting school. Any advice on how to prepare her for that would be much appreciated! As well as survival, the last couple of weeks have been about facing up to the fact we’re actually going to be having a baby pretty soon. I feel suddenly very, very pregnant and people keep asking me how long I’ve got to go, as if they’ve only just noticed the big old bump I’m carrying around with me. I’m met with an instant look of sympathy when I say I’ve got another 3 months! Although 27 weeks seems too soon to get panicky about baby stuff, we did dig out the beautiful moses basket we used for Frog the other day. It’s now sitting in the nursery, along with an empty chest of drawers that used to be my late grandmother’s, a rocking chair and a wall with samples of mint and yellow coloured paint daubed all over it. The baby will be in our room with us for the first few months at least but, for now, the nursery is becoming the place where all baby-related paraphernalia gets placed. We’re slowly squirreling away new bits and bobs, including a couple of things I never had when Frog was tiny: a nursing pillow and a Snooze Shade. Over the next month I need to start making some big decisions about maternity leave and maternity allowance, which is making everything seem even more real too. I’ve already spoken to most of my main clients and have some arrangements in place, but there’s still lots to organise. Any advice you have about returning to work (working from home) as a self-employed new mum would be much appreciated – I didn’t start working again until Frog was 6 months old but I think this time it’s going to be much sooner than that! So how have you been? Are you nearly at the end of your pregnancy or have you just announced you’re expecting (congratulations to Kerry at Oh So Amelia – a brand new addition to the #BlogBumpClub!)? Link up to this week’s #BlogBumpClub and join our friendly blogger antenatal club. It’s the one place you can share your cankle pains without one single eye-roll from people bored of hearing about pregnancy. Promise. Don’t forget to grab the badge at the bottom of this post so others can find out about us too. And, if you’d like to join the chat on Twitter, tweet using the hashtag #BlogBumpClub (if you tweet me – @mollyjforbes – I’ll also be sure to RT your post). « Is four too young for pocket money? You look lovely in the photo, and it sounds like you are doing well and getting organised. I love the moses basket, and the pretty cover on the feeding pillow. Roll on the summer holidays, I hope some relaxed family time together will help you all feel positive about the next adventures! I found that sorting out my maternity allowance, and everything was very very stressful. Hated every minute of it 🙁 hope you have a better experience then me. Poor frog with a broken leg! Blondie Boy will have the same challenges as her–he starts school this August and then new baby comes end of September! Massive congratulations! 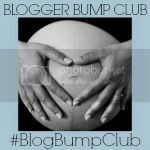 Lovely to see a new blogger join the #BlogBumpClub. I’m so disorganised – we still have a huge amount to sort out before the baby arrives. Roll on the school hols and the teacher husband being at home to start getting things sorted! Technically I know where the Moses basket is, and I think I could probably find the sheets too at a pinch but I’m putting off any kind of preparing until I’m on maternity leave and got the chance to think about what I want where without two tiny assistants! I think you can only do the best you can to prepare for a new baby sibling and school all at once, and it might work in your favour in the sense that she gets something that’s new and hers (school) – I started taking Kitty to ballet class when Elma was really still quite tiny so that we’d have some time that focused on her rather than most things revolving around this small new sister and I think that helped. Here’s hoping! We talk about the baby lots and she speaks to the baby by leaning into my tummy – the other day she whispered, “Will you be my friend when you are born Baby?” which made me well up. Hoping she’s as affectionate come autumn! Ah but one week is SO exciting! Not long now!